Prevent mice and other pests from taking over your attic this winter. Perhaps your New Years resolution was to organize your home including the slightly intimidating attic. This particular storage area catches all those odds and ends that don’t necessarily have a place in other rooms and though not often visited, the attic deserves your attention especially as this is where uninvited pests often make their home. Not only are pests unwelcome, they could also be damaging your home’s structure as well as building materials including insulation and your belongings. Pests such as mice, squirrels, spiders and other insects and rodents are a major problem for New England homeowners, especially during cold winter months. With nighttime temperatures below zero, it’s safe to say the colder weather has arrived and we all know that the New England winter season is LONG. So, if you don’t want to spend the winter with insects and rodents (or even wildlife like raccoons or squirrels) living in the attic as well as other secluded storages spaces, we recommend taking action now. With that in mind, the New England pest control professionals at Modern Pest Services have put together the following tips to help you prevent pest problems in your attic or elsewhere in your home. Be sure that all cracks or openings on the exterior of the home are properly sealed with caulking or filler. Cover vents, install chimney caps and seal around utility openings. Replace cardboard boxes with durable plastic storage totes which have the ability to withstand most pest activity far better than cardboard boxes or plastic bags. Remove the clutter from your attic so that pests do not have places to hide. Continue your year round pest control services to ensure that pests will stay out of your attic and your entire home. To learn more about our home pest control services in Maine, Massachusetts and New Hampshire, please contact us today. Our team works hard to provide ‘modern’ solutions to pest problems including seasonal treatments, non-chemical treatments, and exclusion methods to stop pests before they become a problem. 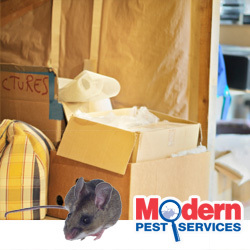 For all your pest control needs in the New England area, Modern Pest Solutions is ready to help!